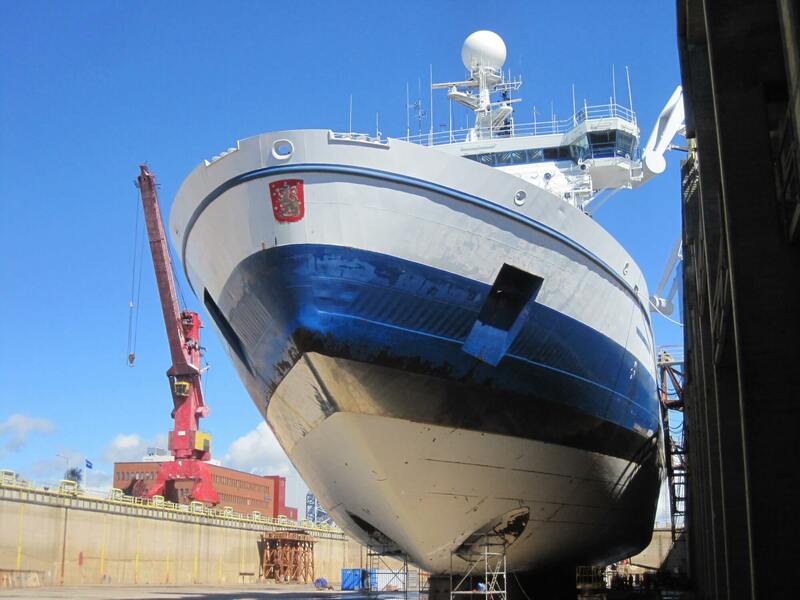 Rauma Marine Constructions completed its first newbuilding vessel for Danish shipping company Molslinjen, a car and passenger ferry named Hammershus, at Rauma Shipyard in the summer of 2018. 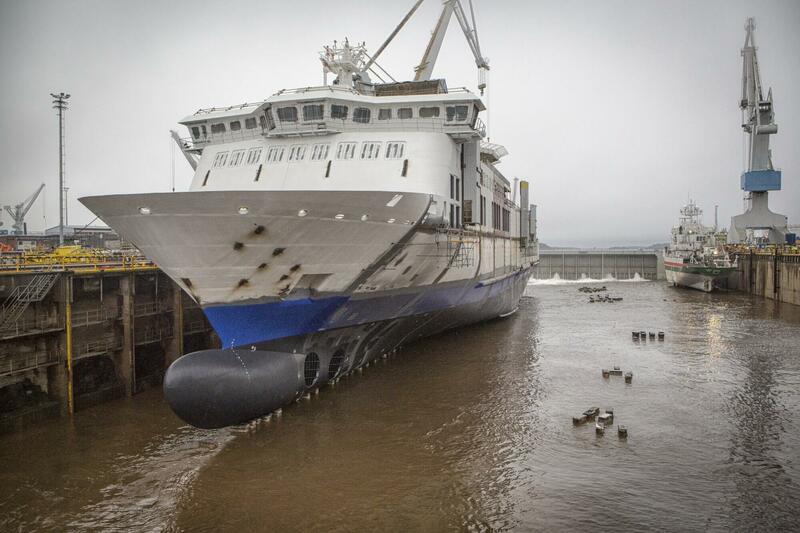 The 158-metre-long and 23.5-metre-wide ferry started operating in the autumn of 2018. The ship’s passenger capacity is 720, along with 20 crew members. The vessel can carry some 90 full-trailer trucks of cargo. Its main cargo is trucks, but the ferry can transport hundreds of personal cars if necessary. The car and passenger ferry can travel up to 17.7 knots and it runs on sulphur-free fuel. The vessel also consumes significantly less fuel compared to previous vessels. This was made possible by the fuel-efficient Wärtsilä main engines, as well as the shape of the hull. In addition, the vessel complies with all current and upcoming environmental regulations. The primary operating route of the ferry is between Køge, Zealand and Rønne, Bornholm, but the ferry will see use for a period of the year on the route between Rønne and Sassnitz in Germany. The ship was constructed in Rauma in full, and its impact on employment totalled around 1,000 person-years. With repairs and modernisation, Aranda is set to remain in operation until the 2030s. The overhaul included the addition of a new block in the central section, and the ship’s aft and afterdeck were redesigned. In total, the vessel was extended 7 m. Thanks to the additional length, Aranda’s research and laboratory facilities could be expanded and the vessel was able to switch to a fully electrical transmission in order to meet new requirements for research. As a result of the overhaul, Aranda’s operations are more environmentally friendly since it is able to run on biodiesel fuel all year round and make short trips with just battery power. The new battery technology lowers emissions and significantly reduces noise pollution, which greatly helps the study of marine biology. 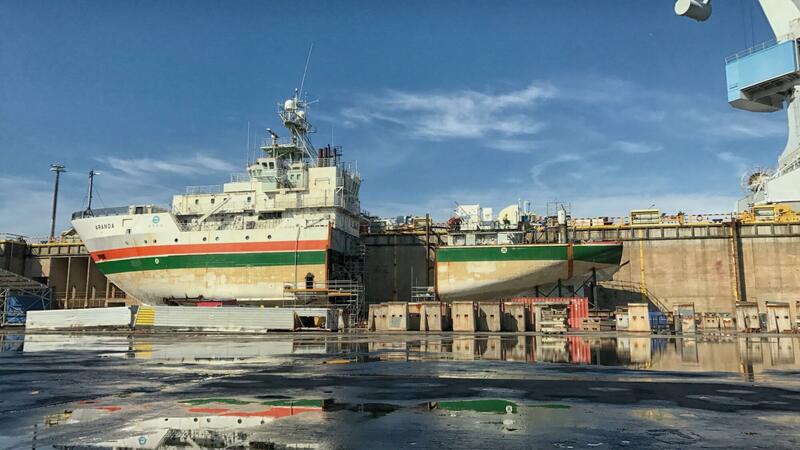 The extensive conversion work for Arctia icebreaker Otso was carried out at the RMC shipyard early in the summer of 2015. In the project, Otso was converted to a specialised vessel capable of more versatile tasks. The ship was fitted with a roll stabilisation tank to enable open water navigation. The conversion also reinforced the ship’s structures in order to upgrade its ice class to match Arctic requirements. In addition to this, the hull was reinforced and the vessel was fitted with new lifeboats and a helicopter deck, both of which meet international standards. Originally designed for the Baltic Sea, the converted Otso can now operate anywhere in the world. The three-month-long conversion project employed dozens of people in Rauma. 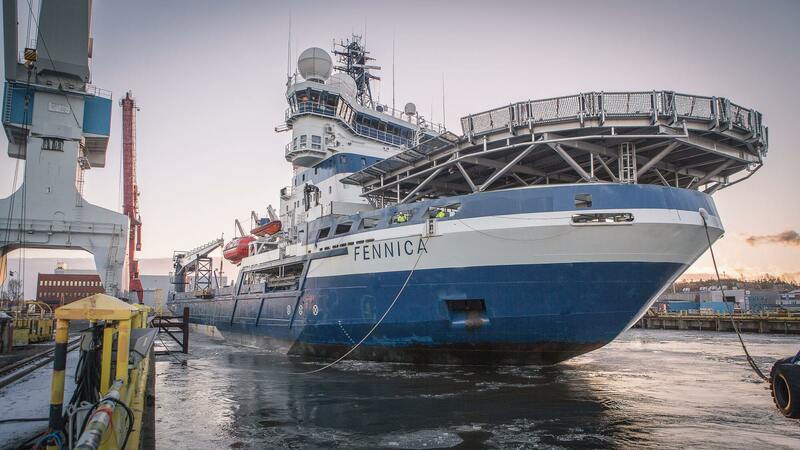 Rauma Marine Constructions has an agreement with Arctia Oy on the maintenance of the multi-purpose vessels Nordica and Fennica. The first round of maintenance work by RMC took place in early 2015. Some 50 metalwork, surface treatment and electrical installation professionals from Rauma Marine Constructions’ network of partners worked on the icebreakers. Both multi-purpose vessels have strong ties to Rauma. Fennica was launched from the Aker Finnyards shipyard in Rauma in 1993, and its sister ship Nordica one year later. 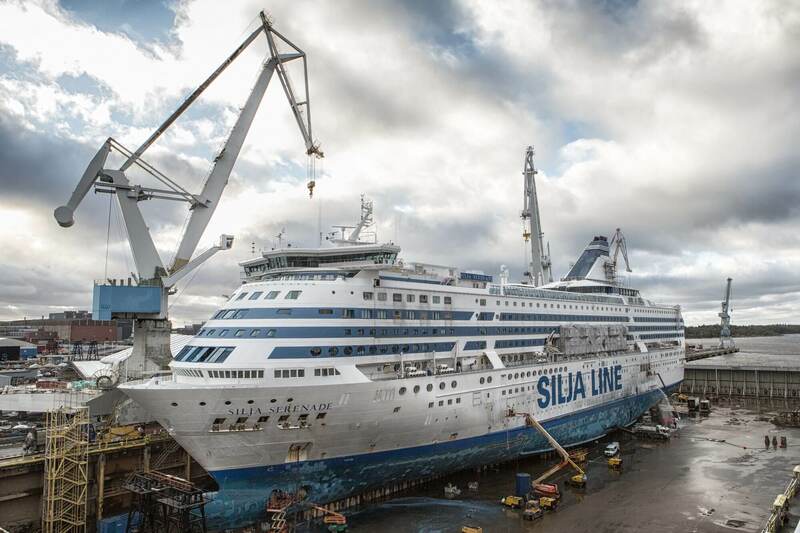 In the autumn of 2015, Rauma Marine Constructions carried out modernisation of the ferry M/S Silja Serenade, which operates between Helsinki and Stockholm. The project included both surface renovations visible to passengers and technical upgrades. The ship’s bottom was repaired, its steering system was upgraded, and one of the main engines was fully serviced. An extensive overhaul was also carried out for the seventh deck, and all 60 deluxe cabins onboard were fully modernised during the two-week dry docking. Modernisation for Silja Symphony took place in early 2016. The vessel received similar alterations to its sister ship, Silja Serenade. All family cabins on Symphony were modernised, and deluxe cabins were redecorated. As with Serenade, the conference area lobby was also renovated. In addition to this, the Old Port Pub in the ship’s aft received new surfaces and furnishings, and a new entrance to the pub and concert stage was constructed on the Promenade. With its own steel production line, Rauma Marine Constructions has delivered several steel structures to the United Arab Emirates. The supplied projects include a recreation area adjacent to the Dubai luxury hotel Burj al-Arab, as well as artificial steel islands and floating villas. 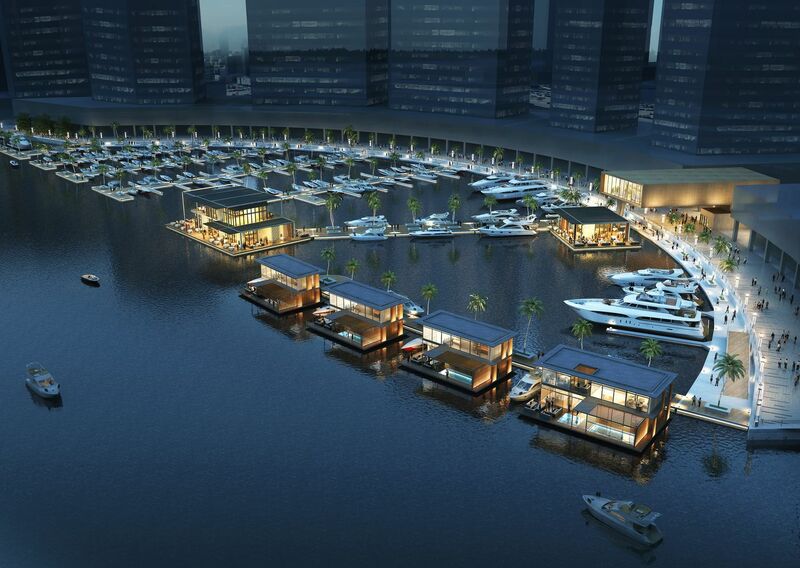 The 10,000 m2 floating recreation area includes a 1,000-tonne beach and restaurants. The structures supplied to the UAE were produced as subcontractor work to the Turku company Admares. Construction of the latest Dubai Properties commission began in Rauma in October 2016, and a delivery of nine floating villas departed for the Persian Gulf in July 2017. In the next shipment, Admares will supply Dubai with another villa, two restaurants and a yacht club constructed in Rauma. Delivery of nine villas to Dubai in summer 2017. One villa, two restaurants and a yacht club to be delivered in the next shipment.